On 26 March 2018, a roundtable discussion with companies about ‘the Global Deal for Decent Work and Inclusive Growth’ was held in Stockholm, Sweden. Around 25 companies, both existing Global Deal partners and other interested attended the meeting. The aim was to provide an update about the recent developments of the partnership and to openly discuss the Global Deal, the business case for enhanced social dialogue and how the Global Deal can be a valuable partnership for companies. Sweden’s State Secretary to the Minister of EU Affairs and Trade, Oscar Stenström, described the recent development of the Global Deal and went through the rationale behind the initiative and the key elements of the partnership. State Secretary Oscar Stenström also highlighted the increasing number of partners and invited the participating companies to join the Global Deal partnership. Other speakers included David Cvach, Ambassador of France to Sweden, who spoke about France’s decision to join the Global Deal and the national Global Deal platform established in France, and Natalia Brzezinski, Senior Advisor to the Global Deal, who shared her view on social dialogue and the future of work and how it can help bridge the old and the new. – The future is here. We need to reclaim new ways of work and I’m convinced that this happens through social dialogue, said Natalia Brzezinski, Senior Advisor to the Global Deal. 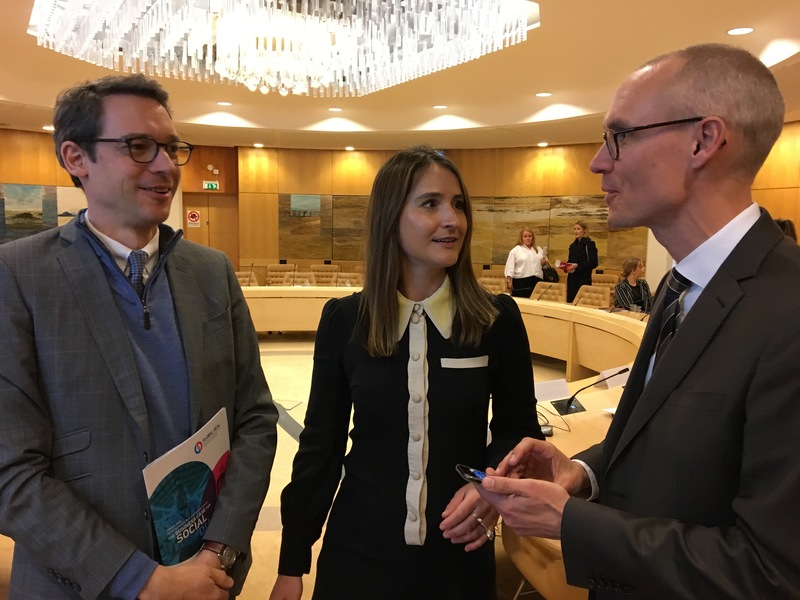 From left: David Cvach, Ambassador of France to Sweden, Natalia Brzezinski, Senior Advisor to the Global Deal and Oscar Stenström, Sweden’s State Secretary to the Minister of EU Affairs and Trade. Two of the existing business partners gave their perspective of the Global Deal, Sofia Vahlne from Scania and Salomon Bekele from Telia Company. – It has been very rewarding to be a part of this partnership so far. The question for companies is: can you afford not to engage in social dialogue? said Salomon Bekele, Senior Advisor at the CEO Office, Telia Company. – The Global Deal is a very good platform to obtain our vision of a sustainable transport system, said Sofia Vahlne, Head of Labour Affairs, Scania.